Designed here at My studio and brought to making in collaboration with a master jeweler! Custom made to your size and gem choice. The perfect marriage of bright summery gemstone and rustic champagne diamonds!! 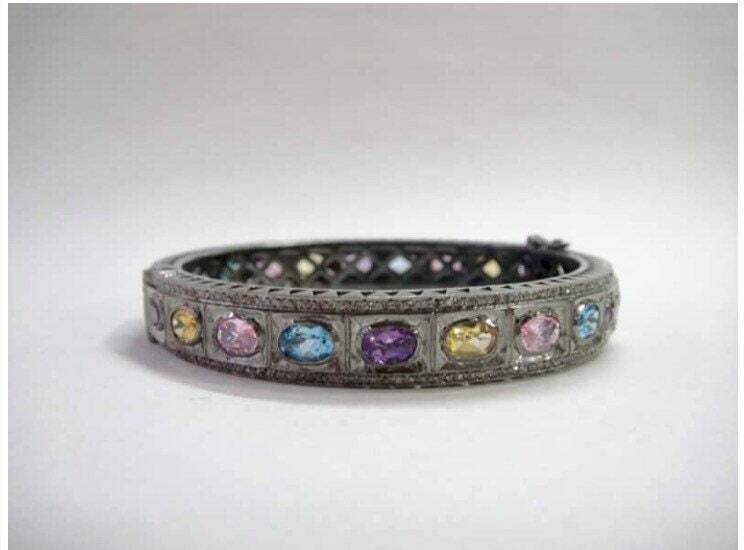 Choose your favorite color/s or birthdays for the perfect mommy gift or family heirloom piece! Featuring Stunning oval faceted gemstones. Grade AAA quality. Shown in natural blue topaz, citrine, amethyst and pink zirconia. Framed in luxurious 1.2 carat natural rosecut diamonds along the borders. Crafted of Sterling silver and antiqued for contrast to make the gems really pop! These easily slip over the hand and also have a hinge and lock for those with larger hands. Please convo for sizing. Birthstones are all natural gemstones.